Increasingly, it is becoming fashionable for mental health agencies and practitioners to become “trauma-informed.” Ostensibly, this is a good thing. But what is happening in reality is far from ideal. Regardless, it’s imperative that any person or system in a helping position consider the context of suffering and what has happened in a person’s life that led to his or her current state of mind. The thing is, this is time-consuming, complex, highly subjective, and individual — everything the system is designed against. 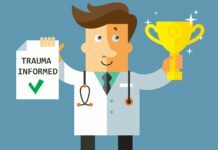 What appears to happen in reality when an organization or individual clinician becomes “trauma-informed” is that old formulas simply get re-mixed with all the trauma ingredients and check-boxes and with none of the actual meaning. It becomes yet another way to advance one’s career and feel good about oneself while pretty much doing nothing different. It’s once again about boxing-in human beings being human beings. Of course, this is not universal — there are many dedicated genuine trauma-informed programs and workers out there that do help many. This article is not about them. But if you’re uncomfortable reading this or find yourself feeling defensive, it might be about you. The following is a glimpse into the numerous ways in which mainstream services and trauma specialists within this mainstream are perpetuating harm while patting themselves on the back for being so progressive and aware. Perhaps one of the more problematic ways that studies of “trauma” have impacted larger society is the implicit message that if an experience is not considered traumatic by the DSM, then it isn’t “bad enough” to cause a person to suffer intensely and greatly. The DSM specifically describes trauma as either directly experiencing or witnessing some life-threatening event, such as violence, war, or sexual assault. Witnessing or experiencing literal threats of death is horrible. But what is considered to be life-threatening to a two-year-old is very different than to a 22-year-old. And what threatens our psyches on an existential level is not always tangible or easily identifiable. What overwhelms the body’s capacity to cope or what leaves a person in a chronic stress state may not be an overt event like assault. Take ostracism, for example. Being ignored, disliked, and left out, no matter how subtle, can be a death sentence for some. It can be more painful and more damaging than physical bullying or abuse. Yet, in the world of the DSM and mental health professionals, it barely counts at all. It’s just not bad enough. Smoking cigarettes is vastly different than taking a gun to my head. But both are likely to kill me at some point. In the 1960s and 70s, family-systems-oriented therapists seemed to grasp a pretty good understanding of the toxic and insidious effects of covert interpersonal dynamics, such as gaslighting, double-binds, and scapegoating. It was understood that psychological dysfunction tended to exist within the complex family or social system rather than within any one individual, even if one individual might take on the symptoms, so to speak, for the whole. This complexity and holistic view has been lost in the age of diagnosis and individual disease, even within family therapy. Because none of these destructive dynamics count as trauma and, certainly, are nearly impossible to measure or capture on a questionnaire, they somehow become irrelevant or triggers of underlying disease. The mental health and trauma fields have come to a place where, essentially, if something cannot be easily identifiable and measurable, it apparently doesn’t matter. Just because something cannot be boiled down to a simplistic question and measured on a 5-point Likert scale does not mean that it doesn’t count. No one can truly capture experiences of chronic oppression, microaggressions, or the struggle of injustice with an arbitrary rating scale. Not everything can be quantified. This doesn’t mean that it doesn’t exist or profoundly affect those who experience such adversities. What ends up happening is that if something cannot be conveniently measured and statistically manipulated, it’s either seen as somehow inferior to “real science” or is ignored altogether. Qualitative research, which is based on the subjective and attempts to capture nuanced narratives, is predictably criticized by those who believe themselves to be serious scientists. In theory, quantitative research is supposed to be objective, unbiased, demonstrating new discoveries rather than common sense, reliable or consistent across studies and investigators, formalized, generalizable, and valid. This is what social sciences value — predictability,lack of complexity, lack of subjectivity or emotion, and robotic-like formulas. Yet, consider that the simple use of different statistical procedures can determine vastly different results using the same data. Or that millions of dollars are spent on brain research so that we can understand totally groundbreaking, non-common sense findings such as that sadness is associated with areas of the brain associated with emotions (and not even all the time!). Think about how researchers tend to find support for their particular affiliation (pharmaceutical, theoretical, etc.) more often than not, or that negative findings are almost never published. Do we really need 100s of studies to tell us that when bad stuff happens, it affects us and can drive us mad? It’s fun to play with numbers and prove ourselves right. Who doesn’t like to be right? It also is super good for job security. But, it isn’t science. And it isn’t helpful. Quite the opposite. It threatens to take a person’s subjective and very personal life narrative and shove it into a formulaic box that is then said to somehow lead to an explanation for why they suffer. Oh, you say that you never felt understood within your family? Like you were bad or not good enough for most of your life? You felt like no matter how hard you tried, nothing ever worked to help you get ahead or find validation and connection with others? Well, none of these things are on my validated trauma questionnaire nor is it included in the ACE’s scale. So nothing has ever happened to you. Sorry. You just have a chemical imbalance and are in need of expert treatment for your genetic mental illness. Even if a person is lucky enough to have their life experiences recognized and validated, there still is the problem of what is acceptable in response to such experiences. If a person can articulate his or her fear as directly related to the identifiable event that a mental health professional deems bad enough to warrant a distressed response, then it might be considered understandable. If the fear becomes diffuse or symbolized, or does not directly link to some overt event, now the person is paranoid or delusional. If someone holds their pain and cries out in ways that disturb others, the person is almost guaranteed to be diagnosed with a non-trauma-related disorder that insinuates internal defect. If the person screams too loud or makes others feel their pain, their personality is said to be disordered. What does this even mean?! This is preposterous. It is not science. Diagnoses are almost entirely based on how any given individual clinician understands the person in front of them. One of the defining differences, for instance, between a dissociative disorder and psychosis is the story one puts to internal experiences. If one feels that some “not-me” forces are controlling the mind or body and attributes this to “alters” or other people living in the body, well this is understandable and said to be dissociation. If the clinician believes that dissociative disorders don’t exist, then the person is told they’re making it up or just seeking attention. Alternatively, if, instead, this possessive experience is attributed to aliens beaming radioactive light waves into the brain (which one might argue is more plausible), now the person has a genetic brain disease called schizophrenia that requires toxic drugs for life. Basically, if a person is in extreme distress and seeks help from a mental health professional, the odds of getting understanding and trauma-informed care are vastly enhanced if you can articulate your experience and pain in a way that the professional understands, is not disturbed by, and can fit into a checkbox or validated scale. There are many things that are helpful for understanding the correlates of what’s happening in the brain with sometimes confusing behaviors or feelings. When a person is in a freeze state, for example, the brain literally goes offline. Aside from basic functions for sustaining life, the brain is playing dead. Trying to talk to a person or forcing such a person to talk back when in such a state is a futile effort akin to making rain return to its cloud. Non-verbal techniques are prudent in this instance — getting angry and further pathologizing and blaming the patient for being difficult, of course, are much more common. For sure, there are distinct brain changes that appear to be associated with child abuse, chronic stress, and other forms of adversity. The hippocampus tends to shrink, executive functioning is altered, the ways in which emotions are processed are different, and ventricles tend to be enlarged. BUT, this DOES NOT equal dysfunction or disease! The brain is an amazing organ that adapts to its environment. One study that actually looked at cognitive differences from the perspective of adaptation showed how a group that had experienced trauma had difficulty with inhibition (i.e., they were “impulsive”). Yet, on the other hand, they were also better at quickly switching tasks and working in uncertain and stressful situations. These are people who might make excellent cops, paramedics, ER doctors, or soldiers. At the same time, they might make terrible librarians. All we hear about, however, is how trauma damages the brain and impairs the victim. And, of course, that a victim is a victim. Experiencing trauma and living with pain and suffering does not absolve a person of responsibility for his or her behaviors. Every perpetrator was once a victim. Too often, however, responsibility is conflated with blame, in that if a person is held responsible for his or her behaviors that person is somehow being blamed or is bad. Victims are good. Perpetrators are bad. People who have experienced trauma are one or the other. Everything is simple. Worse, there rarely is discussion of how the brain actually heals and can adapt to new, safer, calmer environments over time and with a healthy support system. It may get harder to overcome early experiences the older one gets and the more added layers of pain and adversity are added over the years, but the possibility for healing is always there. Healing, though, just might mean something different to the person suffering than the professional needing to fix someone or feel good about his or herself for being a helper and getting rid of symptoms and disease like a real doctor. Many things have been shown to alter the brain’s function and structure: yoga, meditation, relationship, therapy, aerobic exercise, nutrition, and more. And, for most of these, no mental health professional is needed. Trauma can be incredibly damaging, toxic, and difficult to overcome. But it is not a disease nor is it a life sentence. Mental health professionals love to tell the world how they should or should not behave, what are and are not acceptable behaviors, beliefs, and emotions, and how drugs and therapy are needed in almost any given situation. But what they love even more is showing how helpful and needed they are. In the early 20th Century, Christian missionaries turned their efforts to sub-Saharan Africa. No doubt that they were benevolent in their efforts — believing wholly in the power of the gospel and the goodness of the words of Jesus, surely they wanted to give to others by sharing their knowledge and beliefs in far off lands. The outcome of these efforts, however, led to the eradication of centuries-old African customs and the eventual implementation of apartheid. Similarly, it has now been widely recognized that when mental health professionals go into other cultures, especially after a natural disaster or other major tragic social event, they have made things worse. The idea that someone needs to “process” the traumatic event by specific trauma-informed therapy guidelines with a professional has led to prolonged suffering and worse long-term outcomes than those who were just left alone. The book Crazy Like Us: The Globalization of the American Psyche, by Ethan Watters, describes how the exportation of the American mental health industry has led to the loss of local customs and alternative ways of understanding and coping with human suffering. And some of those cultures were better off before our psychiatric missionaries intruded on their society.